William Mayer’s three-act opera is based on two American classics: the Pulitzer Prize winning novel A Death in the Family by James Agee and the play All the Way Home by Tad Mosel. The opera also draws on related passages from Agee’s nonfiction Let Us Now Praise Famous Men. 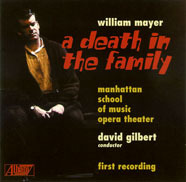 Premiered by the Minnesota Opera Company in 1983, A Death in the Family was cited as the best new opera of that year by the National Institute for Music Theater, Mayer receiving the award from Harold Prince at the J. F. Kennedy Center for the Performing Arts. Further productions include those by the Manhattan School of Music and Opera Theatre of St. Louis, the latter broadcast over NPR with Dawn Upshaw. Scenes have also been presented by colleges and universities, Rutgers University and the Mannes College of Music among them. A day after Jay and Mary are beginning to overcome their differences, Jay is killed in a freak car accident. The loss is incalculable, as the young husband and father was a bedrock to three generations of Follets. Adding to Mary’s burden is gossip about the cause of Jay’s accident, which Rufus has heard from boys on the street. Unaware that he would wound her, he asks his mother point blank, “Was Daddy drunk?” Yet, within the sorrowful context of A Death in the Family, there is also joy and “an undercurrent of humor, expressed both musically and in the text, which keeps the work from becoming maudlin.” —Allan Kozinn, the New York Times. *J. A. represents author James Agee recalling painful early years when he was burdened with the name Rufus. Though often on stage, J. A. is usually an unobtrusive—almost subliminal—presence behind a writing desk, witnessing once again three life-changing days of his childhood that are being acted out on stage. Small roles (many can be doubled): Teenagers (non-singing); Bartender and patrons; Great-Granmaw (non-singing); Fantasy Angel (doubled by Father Jackson); Prissy salesman; Voice over loudspeaker; Gruff salesman; Stranger. Contact Music [at] WilliamMayer-Composer [dot] com for more information. Order online from Albany Records or from Amazon, ArkivMusic, etc. Manhattan School of Music Opera Theater, David Gilbert, conductor.